Lovers, in the left corner you will find Patterson J. Kincaid’s sailor-inspired marvel known as the Melinda Striped Cropped Sweater; in the right corner take a peek at the sassy Stripe Sweater by Textile via Alloy. Though the Patterson pretty is constructed entirely out of ribbed cotton, whereas the tantalizing Textile piece is made out of acrylic; for a mere $34.90, as opposed to the $158.00 needed to take Melinda home, it is a perfect way for the budget babe to take home a bit of nautical style – at a price that won’t break the bank! Thanks to Bergdorf Goodman and Alloy for the pictures. I LOVVVVEEEE your new layout hun! So love this. Great cheaper version. So cool to find this version. Love it! I love the quality of JPK so I'd splurge on this one! Such an amazing find! Love the thrifty version. I could never get tired of stripes. Definitely thrifty. The cheaper one for me! Really cute; definitely going for the cheaper one too! Call me crazy but I'm trying not to shop a lot right now! I'm trying to 1. Pay off my credit card, and 2. Pay off my student loan. My boyfriend and I are planning a trip to NYC in the fall so I want to have money for that! wow, you redesigned! It looks lovely! as for the sweater, save, for sure!! They look almost identical. That's so funny, I just tried on this sweater, the pricey one, but thought I couldn't spend that much. Great match on your part - well done! they're identical! i'd go for textile, not a doubt in my mind! pretty much identical, but i totally love the Textile version better! omg so identical, i love this sweater! I'm going tightwad. $34.90 is an amazing price! I love stripes, and I love cropped sweaters. THese 2 are so identical, so I'm defintiely going for the thrifty option. I think since it's more of a trend sweater than a classic, I would absolutely go for the acrylic one as long as it fit okay. It's amazing that you found such an amazing copy! What a great match! I love the Textile one. Wow, great match! I might have to snap that Textile one up! I'll be the thrifty fashionista in this choosing. I can't belief it's $40. what a steal!!! What a cute sweater ... this time I am going with the 'Textile' one. They are identical and beautiful both. I see no visible difference and I would love to have that Textile sweater be part of my fall wardrobe. Sigh. Great top. I like the texture and how it is slightly cropped. Oh I love this sweater! It makes me think of fall already, ugh, can't wait! I like the Patterson one~! 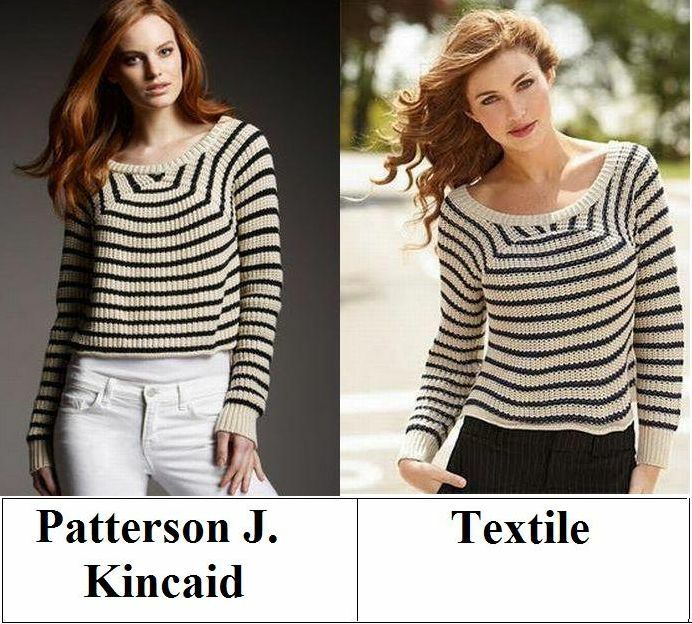 They look more or less look exactly the same, I just prefer what the Patterson one is made from! What a fun sweater! Love both...but 34 compared to 158! I think you know which one I would take! LOL! Hope you are having a great week! I didn't realise cropped sweaters were back in style! A great sweater to have! I LOVE THIS! Stripes are totally my thing. and actually, i like the way the textile one fits the model better. i'd save on this one! I want it to stay summer forever!!!!! No sweaters! Besides being cheaper, the Textile also seems to be figure flattering better! Of course it wood bee better to be made from natural cotton rather than artificial acrylics. I like them both since they look almost the same, but you know me, pricepoint is everything! The less expensive one will always win out in the end! I have been searching for a striped shirt like that FOREVER. Those are perfect!! oh my gosh! i love love love this!! it's soooo perfect! !